Alaska fishing is the stuff of legends, and you don&apos;t need to go far to find out why. The most popular sport fishery in Alaska is in the heart of the city, and local streams are packed with salmon and trout all summer long. Gear up and wet a line! In Anchorage, it’s not unusual to see business people step out of the office, throw on a pair of hip waders and head down to Ship Creek (a salmon stream right in downtown Anchorage!) to reel in an Alaska king or silver salmon - especially during the Slam&apos;n Salm&apos;n Derby in June. With divisions for visitors and kids, not to mention specially tagged fish, you don&apos;t need to reel in the big one to land great prizes. Salmon viewing is plentiful along Ship Creek, but if you’re itching to put a line in the water, rent some gear and pick up your fishing license at a nearby sporting goods store. Campbell Point Lake: Located in Kincaid Park near an extensive trail system; fish for coho (silver) salmon, rainbow trout and arctic char. Jewel Lake: A true gem offering grand views of the Chugach Mountains and many public amenities including a playground, beach area and picnic facilities; contains stocked coho (silver) salmon and rainbow trout. Eklutna Lake: Largest lake in Chugach State Park located 25 miles north of Anchorage, known for its intense, emerald-blue waters; contains rainbow trout and Dolly Varden. Campbell Creek Greenbelt, which flows from the Chugach Mountains to Cook Inlet, also offers public access points and fishing in some areas. Bird Creek and Twentymile River, about 25 miles south of Anchorage, provide excellent silver and good pink salmon fishing along the Seward Highway. 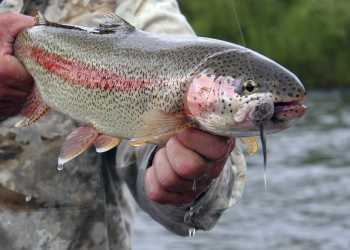 Anchorage is widely used by anglers as a base camp for fishing in Southcentral Alaska. The famous Kenai River is just a couple hours drive south of Anchorage. Halibut and other saltwater fishing are within a half-day&apos;s drive. Prince William Sound (from Whittier) is just over an hour away; Resurrection Bay ( from Seward) is 2.5 hours south. Private boat charters are a good way to get out into deeper waters. There are quick commuter flights to Kenai and Homer. Head north to the Deshka and Susitna rivers for salmon, or cast for grayling and rainbows in Mat-Su area lakes. Most air taxi operators and flightseeing companies also offer one-day fishing charters to remote Alaska areas during the traditional fishing season, as well as in winter for excellent ice fishing. Multi-day trips are also available.